pass. 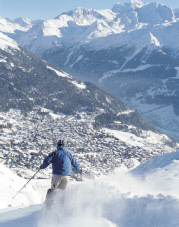 Verbier’s appeal also stems from the distinctive atmosphere, its numerous restaurants and night life. While Verbier remains the capital of alpine winter sports, the region also offers great alternatives with family ski areas as well as a range of opportunities for snowshoe, cross-country skiing or sledding enthusiasts.